A workshop organised by Waikato Calligraphers and featuring the art of brush lettering led by Wellington-based professional calligrapher Alison Furminger was held on the 27 October at The Link, Hamilton. 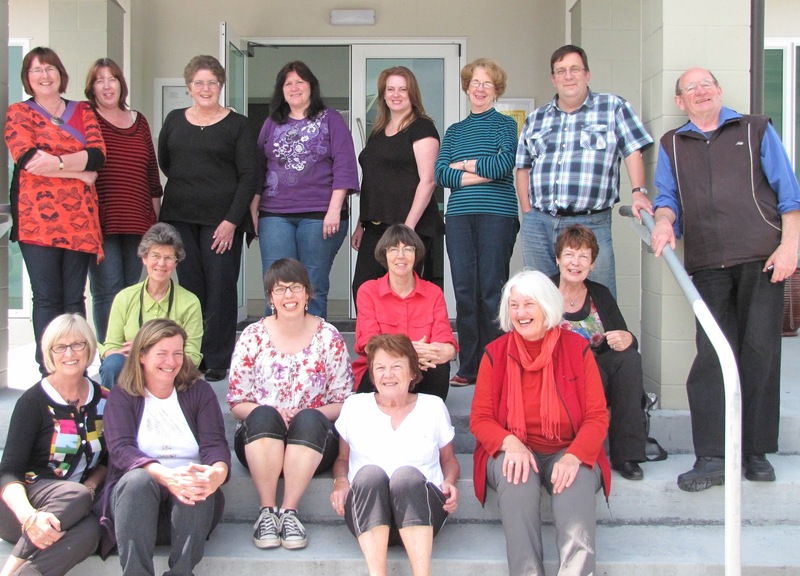 The workshop was made possible with the funding support of Creative New Zealand. Alison demonstrated the skills of pointed brush lettering in the style developed by American calligrapher Marilyn Reaves. Seventeen very motivated calligraphers attended: most from Hamilton, but some came from as far afield as Auckland, Taupo and Papamoa. Many others also wanted to register, but we had reached our maximum number. Four of the group had been lucky enough to have attended Marilyn Reaves New Zealand workshop in the mid 1990s. A group photo from that long ago workshop was circulated during the day and someone suggested that we too should have a group photo. After lunch we all trooped out for a photo shoot on the steps of The Link. Left to Right, Standing: Marian, Robyn, Jenny, Kathe, Lynette, Jan, Nigel and Tom. Sitting top step: Lesley, Judy, and Pam. Middle step: Alison and Maree. Bottom step: Rose, Rebecca, and Bridget. 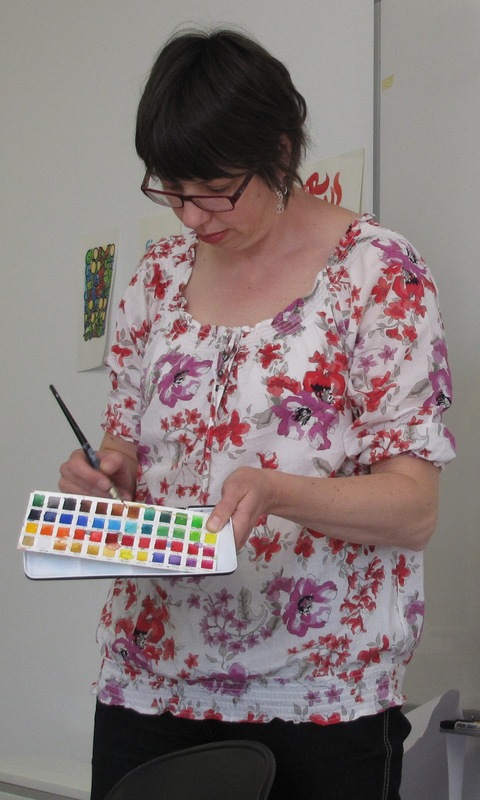 Alison started with the basic brush strokes and then gave a letter by letter demonstration. Her approach was especially helpful because she constantly circulated giving advice and encouragement. Many of us experimented with colour and some even lettered a favourite quote. With all this concentrated effort we still found time to get to know others in the group, with lots of good hearted banter and appreciation of each other’s work. When our catered lunch arrived the room was abuzz with noise - old friendships were renewed and new ones formed. Everyone had a very enjoyable day. We are very grateful to Alison for travelling to Hamilton, for her clear instructions, her gentle suggestions and her inspiring creativity. Report by Pam Fricker, photographs by Elaine Riddell.